On Saturday the Rients family adventured in the City-State of the Invincible Daley, also known as Chicago, Illinois. After our visit to the awesomely cool Shedd Aquarium, we made our way across town to Games Plus in nearby Mount Prospect. This was my first time at Games Plus, but I had heard through the grapevine that it's one of the best nerd shops in the state. It did not disappoint. The only comparable shop I've seen is the Source in St. Paul, Minnesota. Just to give two examples of the righteous selection they have in stock: if you ever wanted to get in to Star Fleet Battles, they had pretty much the whole line including all the figures (more fleet boxes than I realized were in production!) or if Palladium is your bag they seemed to have nearly every book they ever published. I kinda wanted to pick up Rifts Japan after reading this article but I couldn't find it hidden in the huge pile o' Rifts! Next to several shelves packed with Dungeon Crawl Classics was a HackMaster display that also had some stuff for OSRIC (the 1st edition AD&D retro-clone) on the shelf. This was the first time I had seen OSRIC material for sale at a brick-and-mortar store, so that was pretty cool. 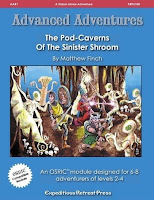 I ended up getting the first module in the Advanced Adventures line, Matt Finch's The Pod-Caverns of the Sinister Shroom and the OSRIC monster book, Malevolent and Benign. Games Plus also stocks Gamescience dice, so I got a purple set of polyhedrals. 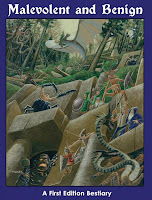 Pod Caverns came out back in 2006, before the old school renaissance went to hell in a hand-basket (or so the critics say). After a quick read-through I really like it and would definitely use it in my own campaign, whether I was using OSRIC/AD&D1 or not. The maps aren't marked as thoroughly as I would like, but there's nothing stopping me from correcting that myself. Malevolent and Benign I haven't had a chance to look at yet, but that Pete Mullen cover is wicked awesome! While the store was great, the best part of my visit was the people. I had a great little chitchat with Michael "Chgowiz" Shorten and Marv, a.k.a. Finarvyn, the dude behind the OD&D Discussion boards. It was extremely cool of both these guys to take some time out of their days just to shoot the breeze with me for a while. We talked about getting together again under circumstances where we would have time to play a game, maybe at GaryCon. In fulfillment of a previous agreement, I swapped Michael a copy of the Miscellaneum of Cinder for a copy of the latest version of his Ultima-themed Swords & Wizardry rules. He also threw in a copy of the Swords & Wizardry Quick Start and I gave him one of my homemade Encounter Critical booklets. He said he could find a home for a few more copies, so I gave him the three extras I had with me. I managed to get one of the EC books into Marv's hands as well, so if he changes his board's name to EC Discussion you'll know who to blame. I had met Michael once before when he came down to Winter War. At that event he struck me then as a fun, enthusiastic guy with a big heart and this get-together only confirmed my earlier impression. And I really liked Marv as well. The easy-going, level-headed way he runs the ODD board is a reflection of how he is in person. I'd definitely sling dice with either of these guys, or just kick back and have a beer with them. And I don't even really drink beer. Aw, that's really cool of you to hand out EC to folks! I visited there just last week. Also picked up one of XRP's adventures and Malevolent and Benign. Also got Points of Light II. Didn't get to meet Chicago Wiz or Finarvyn there (although both of their recommendations are why I went there). The guys who were there were quite nice, though. Being able to get brand new old school campaign setting, monster book and adventure off the shelf was quite cool. Sign on word: Prerlest. Even prerlier than that. I'd love to read your review of Malevolent and Benign. We'll definitely do beers/fav beverage soon. I still owe you and your gang a USW playtest. Saw the cool OSRIC stuff and was just fairly amazed at the mass of cool stuff there. Good to hear that some OSRIC products are making it into gamestores. The only place I've seen any OSRIC products is the "Hairy Tarantula" in Toronto, and they usually stock only one or two. Games Plus is the bomb. I grew up with that store. Great guys, awesome space. Unfortunately, I was only rarely able to get out to them after they moved across the tracks, and I haven't been there since I moved away from Chicago, but I've still got a lot of great memories with Games Plus. Now I have a name for my Chicago-based campaign for The Day After Ragnarok. I was pretty much out of gaming during the time I lived in St Paul, but even so I couldn't resist heading to The Source now and then just to ogle at the sheer volume of stuff. Games Plus is Travis' gaming hangout (since he moved up north). He always talks about how cool it is, but he would think a 2ft x 2ft cardboard box was cool if there was a game inside.